Kirsten Walsh (Institute for Research in the Humanities), Michael Deckard (Fullbright Fellow, University of Bucharest). One of the most persistent received views in the history of philosophy/history of science attributes the emergence of modern science to a change in the representation of space. Thus, according to Koyré, modern science began when Galileo and Newton started to do physics in the three-dimensional, Euclidean space. As most of the other foundational stories of the Scientific Revolution, Koyré’s account has been repeatedly criticized and qualified. And yet, there is something fundamentally appealing in his connection between the fundamental breakthroughs of the early modern classical mechanics and the “geometrization of space.” It is intuitively compelling to think of “modern physics” as something taking place “in space” and of the universe of the moderns as consisting of infinite, homogenous, three-dimensional space, in which bodies are placed according to the laws of mechanics and geometry. The general aim of this course is to rehearse some of the elements of this standard story by appealing to primary texts. Most of our meetings will be organized as reading groups. Students will be required to read and discuss, but also to make short presentations of the authors under discussion, as well as to analyze and comment on primary and secondary sources. By reading and investigating primary sources, we will test some of the claims put forward in the ‘standard story,’ and we will see to what extent it can be amended or replaced by another one. The course has two main goals. First, to investigate the diversity of competing conceptions of space in the sixteenth and seventeenth centuries and to discuss to what extent they correspond to different views regarding the relations between physics (natural philosophy), mathematics and theology. Second, to offer an alternative story to Koyre’s “geometrization of space.” I will argue that the science of space emerged from discussions and debates over a cluster of natural philosophical concepts which we would subsume today under the general notion of force. In the sixteenth and seventeenth centuries these concepts were called virtues or faculties, and were sometimes associated with minds, animal faculties or even souls. The course will primarily consist in reading, discussing and investigating primary sources. 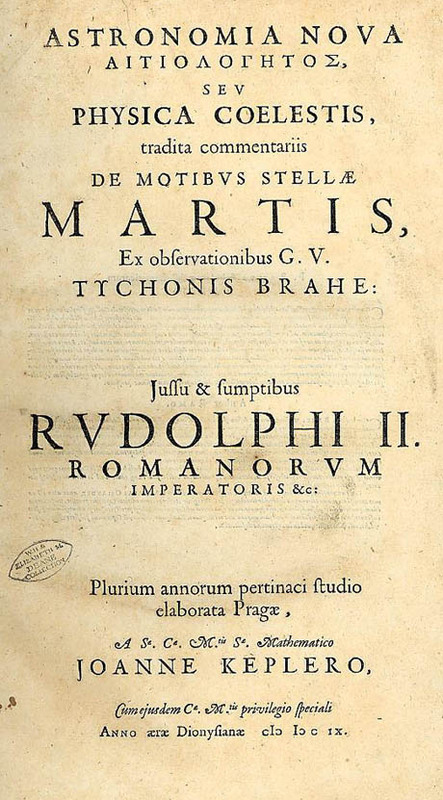 The list of reading contain some of the canonical texts of the scientific revolution (Galileo’s Dialogue, parts of Newton’s Principia, Descartes, Principles of philosophy, Berkeley, De motu) and some lesser known (or even completely unknown) texts belonging to William Gilbert, Thomas Digges, Giordano Bruno and Francis Bacon. The standard story (1) Koyre’s interpretation of the interplay between metaphysics, astronomy and theology. According to Alexandre Koyre, there are two preconditions of the Scientific Revolution: the replacement of the Aristotelian cosmos with the ‘infinite space’ of the moderns and the geometrization (‘mathematization’) of (infinite) space. They have a common cause: the ‘dissolution of the celestial spheres’. The purpose of this lecture is to discuss this claim. 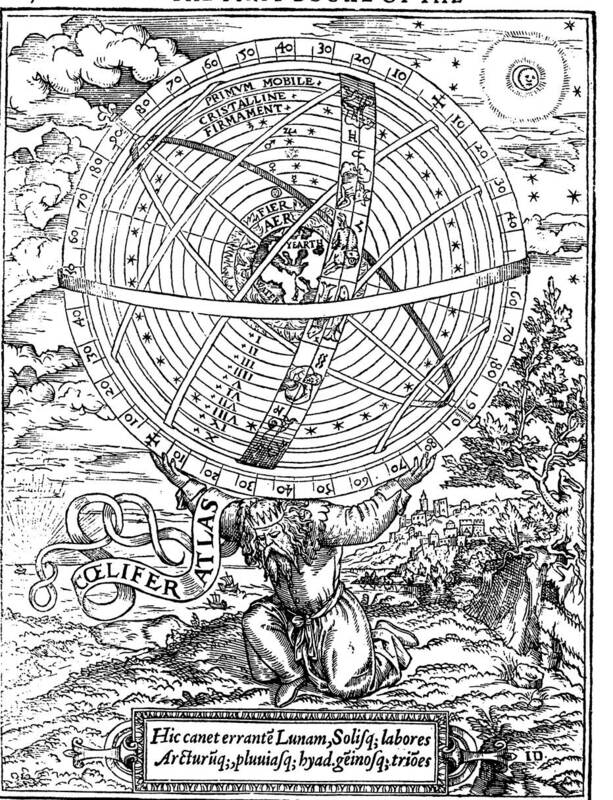 We will first examine the main elements of the “Aristotelian cosmos”: the two spheres (the elemental sphere and the celestial sphere). Then, we will inquire into the constitution of the planetary spheres. The main questions of this meeting are: Why are these planetary spheres solid? When did they become solid? Are there alternative traditional views of the world in which the planetary spheres are NOT solid? 2. The standard story (2): A “geometrization” or a “materialization” of space? Galileo Galilei’s “Platonic” vision of a mathematical space plays an important part in Koyre’s story. It is based on a particular reading of the first part of Day I of the Dialogue on the two world systems (the Platonic ‘fable’ of the creation of the world). 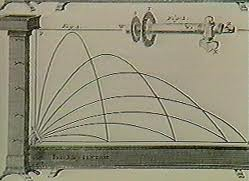 What is the relation between mathematics and physics for Galileo? Is Galileo’s ‘physical space’ infinite? How about the ‘mathematical space’? Readings: Galileo, Dialogue, Day I (fragments) pages 1-45 (see the text in the drop-box). 3. The end point of the standard story: the Newtonian absolute space. 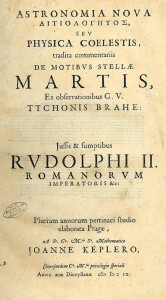 Newton’s De Gravitatione and Principia (scholium to the definitions). B.J.T. 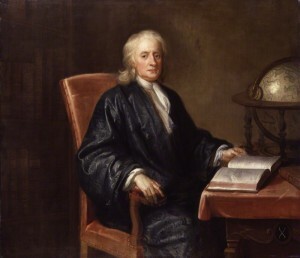 Dobbs has called Newton ‘the final cause’ and ‘first mover’ of the story of the Scientific Revolution. For Koyre, he is clearly the final cause in the story of the dissolution of celestial spheres and the ‘mathematization of space’. The terminus point of the Scientific Revolution is in the ‘standard’ texts illustrating Newton’s conception of absolute space. The purpose of this lecture and the ensuing seminar discussion is to read and investigate comparatively the two texts taken to contain Newton’s conception of absolute space, i.e., the unpublished De gravitatione and the scholium to the defition of space, in the Principia. Questions: These are the texts which are supposedly illustrating the standard conception of absolute space. And yet, at a closer reading, one can see that Newton seem to have more questions than answers regarding the nature and functions of ‘absolute space.’ Is space more like a substance? Is space more like an accident? What functions does absolute space play in the construction of Newton’s theory? Recent historians of science give an interesting alternative account to the “Copernican revolution”. 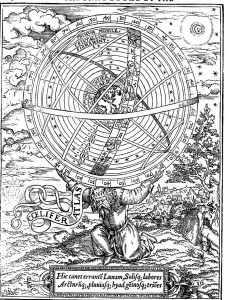 In it, Copernicus figures as a humanist: and his methods are the historical methods of the Renaissance. At least some of Copernicus’ followers are humanists, as well as ‘mathematicians’. 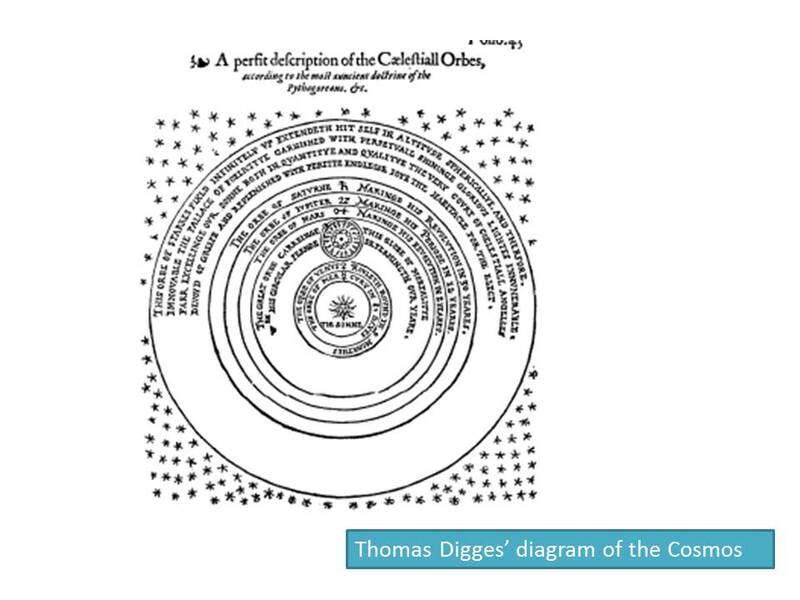 The purpose of this lecture is to introduce one such early Copernicans and to discuss his conceptions of the inter-relations between physics, metaphysics and mathematics: Thomas Digges (c. 1546-1595). 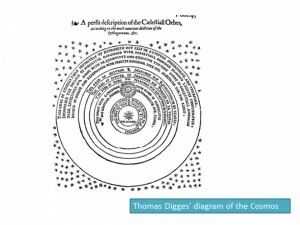 Mathematician and humanist, gentleman and member of the Parliament, Digges is usually classified as one of the ‘practical mathematicians’ of the late sixteenth century and one of the first Copernicans. His works and career constitute an interesting mixture of pure and applied mathematics, Platonism, engineering and astronomy – a mixture that does not fit nicely in Koyre’s story. Giordano Bruno figures prominently in most accounts of the metaphysics of space in the Scientific Revolution, although scholars rarely agree on the particulars of this story. 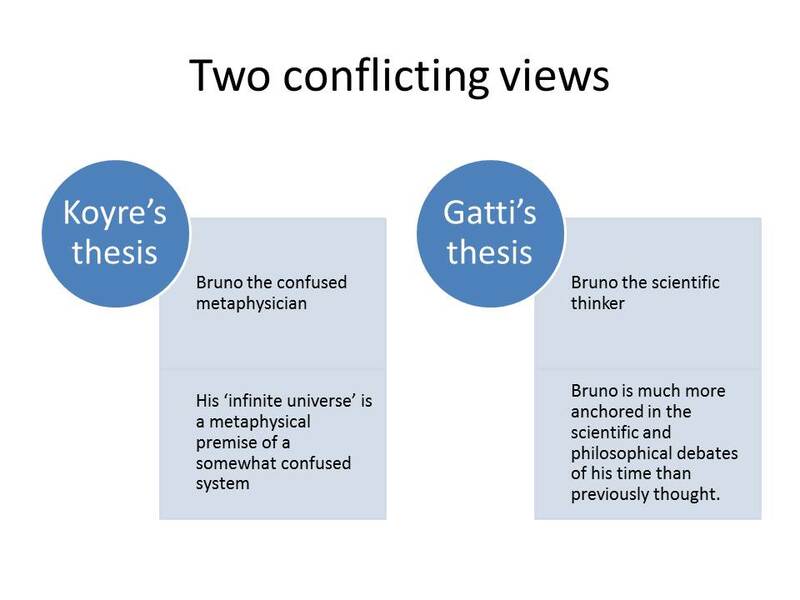 The slide posted above illustrates the conflicting reception of Bruno’s ideas. 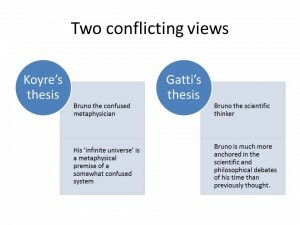 In this lecture I will concentrate on two conflicting views regarding Bruno’s conception of space (as illustrated in the next slide). William Gilbert is not part of Koyre’s story. And yet, his magnetic philosophy is of essence for the constitution of a new conception of space in the Scientific Revolution. The purpose of this lecture is to discuss Gilbert’s notion of the ‘orb of virtue’ and his proposal for a ‘science of the orbs themselves’, i.e. a science of the ways in which the magnetic virtue is constituting and organizing the space around magnetic bodies. Central to Astronomia nova is the question of the force which keeps the celestial bodies on their (elliptical) paths around the Sun. Unsurprisingly, for Kepler, this force is magnetic. 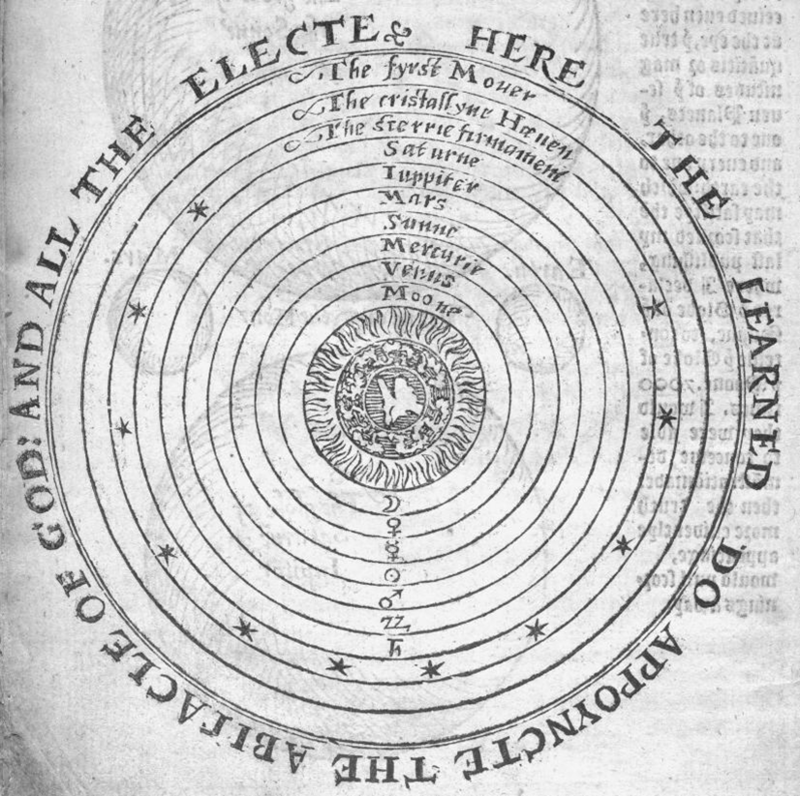 In his correspondence, Kepler claims that his purpose is to place a “celestial roof” on Gilbert’s magnetic philosophy, i.e., to extend the magnetic philosophy (and the science of the orbs themselves) to the whole universe. 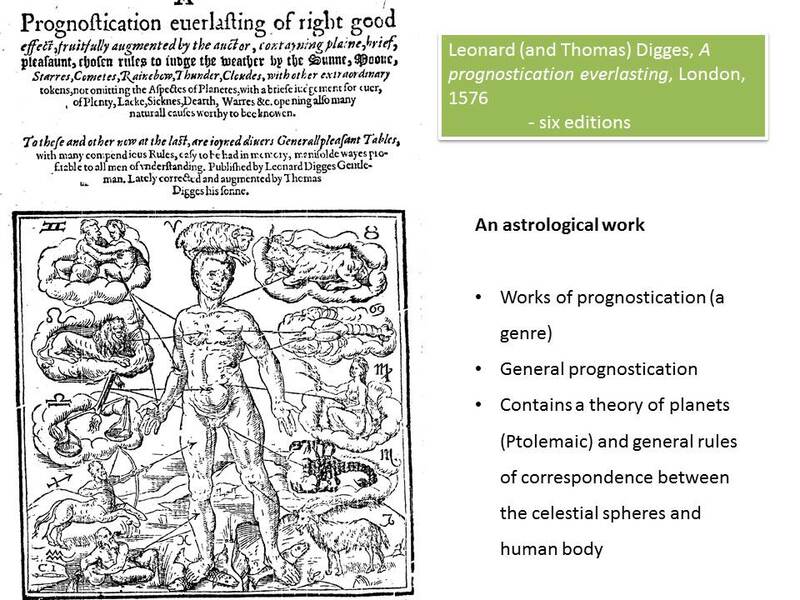 The purpose of this lecture is to place in the context Kepler’s project and to introduce the rich and interesting preface to Astronomia nova (a text which circulated in the first part of the seventeenth century much more widely than the book itself). In days II and III of the Dialogo, Galileo also confronts the problem of force which keeps he planets on their orbits and ensures the stability of the Solar system. What is the nature of this force? Is it magnetical? Day III raises the questions of “Gilbertianism” – to what extent Gilbert’s magnetic cosmology can be the very answer to the problem of celestial dynamics? We have seen so far what are the costs of dealing with ‘soul-like’ forces. It is time to investigate the alternative view, what has been called ‘the mechanical philosophy.’ What is the alternative solution to using forces to ‘organize’ and define space? The purpose of this lecture is to introduce Descartes’ solution to the same problem and to investigate the costs of his anti-vitalist, mechanical natural philosophy. Question: is the formulation of the law of action and reaction a “way out” of the problems discussed so far? There are costs of Newton’s solution as well, and the most problematic of them is the much discussed problem of the action at a distance. The seminar will begin with a 20 min presentation of the author whose text is under discussion. Students are required to choose one author and to prepare such a presentation, focusing on the context of the text for the seminar and the relevant details for its understanding. In introducing an author it is important to emphasize what was his general plan/project and how does our reading relate to that more general plan. Also, I would like to know more about the intellectual context in which our author’s ideas have developed, about his intellectual sources, friends and foes, about his successes (in his own time: was he read? Did he have students and followers?) and failures. Try to reconstruct a portrait as free as possible from the various biases of the various historiographies. Write a 4-6 pages ‘introduction to a primary source from the bibliography. Explain its main ideas, define its terms, place it in the context (among the author’s other writings, for example), provide the reader with the appropriate footnotes (definitions, explanations of terms, references to the background etc.) and the running commentary that would help her understand the text better. Koyré, Alexandre. 1958. From the closed world to the infinite universe. Library of Alexandria. Miller, David Marshall. 2014. Representing space in the scientific revolution. Cambridge University Press. Gilbert, De Magnete, book V, ch. XII, book VI ch…. (Leibniz 1 (1-4), Clarke 1 (1-3), Leibniz 2 (1), Clarke 2 (1), Leibniz 3 (1-7), Clarke 3 (2-8), Leibniz 4 (3-6, 7-11, 13-20, 41), Clarke 4 (all), Leibniz 5 (29-53, 60)). Freudenthal, Gad. 1983. 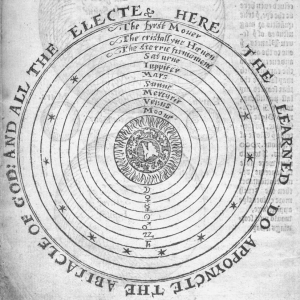 Theory of Matter and Cosmology in William Gilbert’s De magnete. ISIS 74 (1):22-37. Gatti, Hilary. 2002. 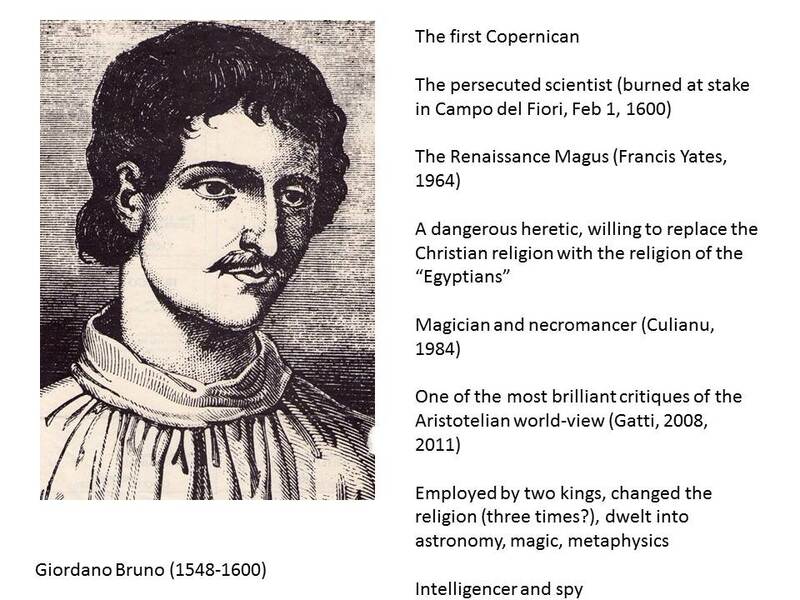 Giordano Bruno and Renaissance Science: Broken Lives and Organizational Power. Cornell University Press. Omodeo, Pietro Daniel. 2014. Copernicus in the Cultural Debates of the Renaissance: Reception, Legacy, Transformation. Brill. Pumfrey, Stephen. 2011. 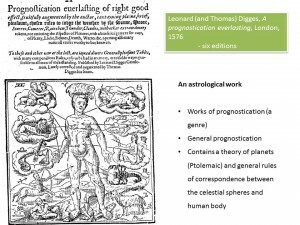 ‘Your astronomers and ours differ exceedingly’: the controversy over the ‘new star’ of 1572 in the light of a newly discovered text by Thomas Digges. British Journal for the History of Science 44:29-60.